Don emphasized in our interview with him how stressful the war was from the beginning to end. Throughout the war he and others were subjected to surprise attacks from Viet Cong in the boiling hot tropic atmosphere of South Vietnam. As a photographer, Fedynak was both a witness and an active participant. While he was subjected to the same training, housing, and other rituals of infantry soldiers, his job often involved dropping into locations for a limited amount of time to take photos. He was mostly an observer of the war, viewing battles through his camera lens. He spent most of his time observing soldiers that experienced rougher conditions than him, so his writing reflects others’ experiences as well his own. 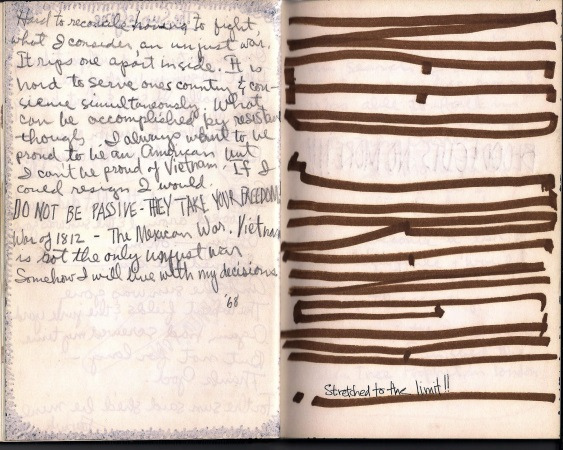 During the War, many GIs experienced anti-war sentiment and were aware that they were fighting an “unjust war” Don’s notebook provides a glimpse of this. Many of the anti-war advocates were from lower income backgrounds and were drafted against their will. Don, who is from a middle class background and who had volunteered for the war, felt that he still had to do his duty despite his negative outlook of the war. “Somehow I will live with my decisions” his notebook grimly concludes. He remains committed to the cause despite his disagreement with it. Unlike Don, many soldiers rebelled and protested in Vietnam. Some were deserters, fleeing to Europe. Others rebelled in active combat zones. Hundreds of soldiers were charged for refusal to fight. Some soldiers even turned violent against their superiors who were ordering them to fight. The 101st Airborne division rebelled after their famous charge of Hamburger Hill. Hundreds of fraggings, when soldiers would throw fragmentation bombs under their superiors’ tents to protest their orders, occurred. The notebook remains a powerful artifact demonstrating the conflict of having the duty to serve one’s country while knowing that the war is unjust. Barringer, Mark. The Anti-War Movement in the United States. Accessed August 10, 2017. http://www.english.illinois.edu/maps/vietnam/antiwar.html. Don Fedynak, interview by Ben Ginsburg, Angelica Pomar, Josie Tavera, Riza Uddin and Jasmine Balderas. August 1, 2017, The Vietnam War Oral History Project, New-York Historical Society, New York, New York. Ed Blanco, interview by Soliman Aboutaam, Sumin Chen, Aisha Martino, James Kuntz. July 19, 2017, The Vietnam War Oral History Project, New-York Historical Society, New York, New York. “GI opposition to the Vietnam War, 1965-1973 – Howard Zinn.” Libcom.org. Accessed August 08, 2017. https://libcom.org/library/soldiers-opposition-to-vietnam-war-zinn. Hochgesang, Josh, Tracye Lawyer, and Toby Stevenson. The Psychological Effects of the Vietnam War. Stanford University. Accessed August 10, 2017. https://web.stanford.edu/class/e297c/war_peace/media/hpsych.html. Journal, 1966. Courtesy of 1st Lt. Donald Fedynak (ret. ), 221st Signal Company, 1st Signal Brigade, 1969–70. Learning History from Movies: Good or Bad? I am studying an item in our collection called the “Draft Wheel.” The “Draft Wheel” is an item that helped initiate the worst urban riots in United States History. Some believe that the riots escalated to such a dangerous level because of Republican Mayor Opdyke’s reaction to the resulting riots in New York City.